On rare occasions, you really do get a chance at a do-over. A do-over for something really important would be even rarer, but circumstances have given me the chance to do Second Great War at Sea: The Habsburg Fleet all over again. And we’re giving the new edition free to Gold Club members as part of the SWWAStravaganza promotion (yeah, you have to buy some other new stuff to get it free, but it’s still free). Some years back, we made a downloadable supplement called Imperial & Royal Navy, and then doubled down on that by printing actual die-cut pieces for it. That was a mistake, and we ended up with thousands of leftovers. In those days we lacked the print-on-demand capability we now enjoy, and answering the call of some fans for “real counters or bust” pretty much turned out to be a bust. But then we came up with the Second Great War alternative history setting, and created The Habsburg Fleet as a story within that setting that made use of all those pieces, and added an extra half-sheet. And then we ran out of them. The Habsburg Fleet’s first edition drew on our old Bomb Alley game for maps and pieces, which itself went out of print soon after we released The Habsburg Fleet. With a replacement game (La Regia Marina) in the works, it only made sense to re-issue The Habsburg Fleet, modified to match the new game's map and pieces (which are not the same as those in Bomb Alley). So what’s different in the new edition? Most obvious is the reduction in pieces, from a sheet and a half to just one: 80 “long” ship pieces and 120 square ones (silky-smooth die-cut pieces this time). The original Imperial & Royal Navy just slotted the Austro-Hungarian Empire into the Second World War, without much explanation of how this came to happen and no linkage between the scenarios. That meant adding ships and planes of similar type to those in Bomb Alley, and it also meant filling the entire sheet (since it originally appeared as a download) even though the scenarios didn’t really require that many ships and planes – we knew gamers abhorred white space. That made the Habsburg fleet of The Habsburg Fleet larger than the story line really demanded. It’s been trimmed down in the Second Edition, mostly losing destroyers and torpedo boats along with some cruisers. There are a few reductions among the other fleets, but not many – most of those represent “real” ships that now appear in the upcoming La Regia Marina, like the French heavy cruiser Algérie. The world of the Second Great War isn’t quite the same as the world we think we know. The First Great War ended in late 1916, before heavier-than-air flight became dominant and before the aircraft carrier had seen action. Without the burden of reparations, the German economy never knew hyper-inflation and never dragged the rest of the world into a massive depression. The Second Great War breaks out in what is a richer world, for the most part. While airplanes are not as technologically advanced as those of our 1940, both military and commercial airships float above the clouds. In military terms, helicopters and autogyros are more common, and often more useful, than fixed-wing aircraft. There is a definite steampunk flavor to the Second Great War; the jets and missiles and whiz-bang technology appear in our other alternative-history setting The Long War. All of that means that the mix of aircraft in The Habsburg Fleet Second Edition is totally different than that of the first. The jets are gone; pretty much all of the fixed-wing aircraft are gone. The Austrian aircraft carriers are also gone (there were other nations’ aircraft carriers present in the scenarios, but the pieces for them came from Bomb Alley). In their place are more helicopters, more autogyros, more seaplanes and more biplanes. Submarines are also less effective in the revised Second Great War at Sea setting than in the standard Second World War at Sea. Unrestricted submarine warfare never resumed during the First Great War (as occurred in early 1917) after the German Navy abandoned the practice in September 1915. The very advanced German boats built in the last years of the First World War never took form in this reality, at least not in 1917 and 1918. Like fixed-wing aviation, submarine technology is at least a decade behind that of the familiar Second World War. From the opposite angle, the helicopters and autogyros deployed by most of the world’s navies in this setting are very effective anti-submarine platforms, much moreso than fixed-wing aircraft. Those manipulations of history move the deus ex machinations behind the Second Great War at Sea: it’s a battleship game, with its history deliberately warped to create a more-or-less believable series of large- and small-scale surface actions determined by heavy guns. As in the first edition, the scenarios and story line emphasize the role of battleships in deadly actions in the Adriatic, Aegean and elsewhere in the Mediterranean. And there’s a great deal more story in the Second Edition. We’ve moved the Ship Data Sheets from the book itself to a small booklet of their own included with the package. And the new edition uses the upcoming new edition of the Second World War at Sea series rules, which vastly reduces the space given over to special rules (since most of those are now part of the “core” rulebook). That allows us much more space for the fun stuff: more about the ships, more about the story, and more scenarios. The story line now extends later into the Second Great War. Despite the changes to ships and technology, the story still focuses on the struggle of the outnumbered Central Powers navies (Austrian, Turkish and German) against the much larger but sharply divided Italian, French and British fleets. We sort of fell haphazardly into the Second Great War at Sea setting. Of the three books published to date, two were built around pre-existing sheets of pieces left over from that ill-advised foray into large-scale printing of formerly downloadable items mentioned up above. The third had already been laid out for similar treatment and we left it intact. The vision of a unified setting telling a story across all of the books and many more only came fairly late in the process. This reboot has given us the rare opportunity to put that story arc in place from the start, with a set of pieces that truly match the setting. I wanted to avoid bringing out an alternative history expansion that was simply the same game, more or less, with different-colored pieces. The slightly different technological track, combined with the geopolitical changes, makes for a radically different game on the same map as La Regia Marina, making for nearly-endless replayability and a whole lot more fun. Plus you can get it for free. 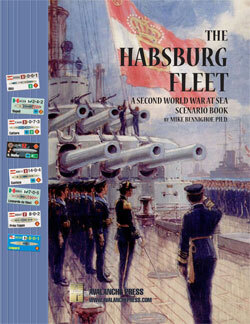 Don’t wait to put the rebuilt The Habsburg Fleet on your game table! Join the Gold Club and find out how to get it at a discount! Mike Bennighof is president of Avalanche Press and holds a doctorate in history from Emory University. A Fulbright Scholar and award-winning journalist, he has published over 100 books, games and articles on historical subjects. He lives in Birmingham, Alabama with his wife, three children and his dog, Leopold. Leopold is not included in the Second Edition.